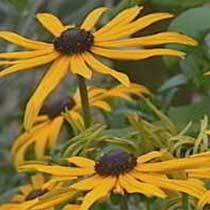 Rudbeckia or cone flower are a flower power must have. They make large clumps of lance shaped leaves and then flower their socks off from July right through to the harder frosts. They look pretty, even after they have died off for the season as the coned flower heads make super little dining platforms for small birds to pick out the seeds. There are quite a few garden varieties grown but by far and away the best and easiest to keep is Goldsturm. They are all quite tall growing and make fabulous cut flowers. If you have tried and failed with echinacea these are the plants for you.